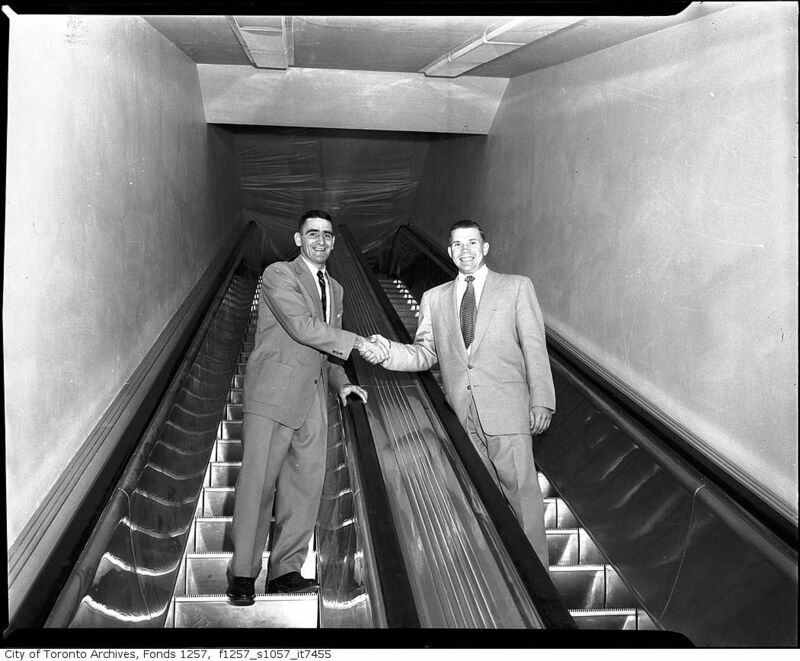 Staircasing: Leafs captain Sid Smith and goaltender Harry Lumley ride the new escalators at Maple Leaf Gardens in October of 1955. O for the failures of Leafs yesteryears. 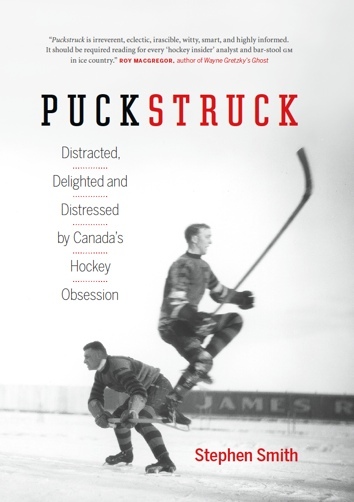 Heading into a new season in October of 1955, the Toronto Maple Leafs were just five years removed from their last Stanley Cup championship. That didn’t keep president and managing director Conn Smythe from an apologetic address to fans on this day, 61 years ago, as he presided over a Maple Leaf Gardens open house to show off a brand new set of escalators. Rest assured, Smythe told the gathered masses that day, the new hardware was not a ruse by management to distract from the Leafs’ lack of recent success. Maple Leaf Gardens was 25 years old that year. To celebrate the anniversary, the Leafs invited Torontonians to a Wednesday-afternoon wander through the corridors of the home arena. Why not? The following day they’d be opening the season in Montreal against the Canadiens. Fans would be welcome to browse the dressing rooms, the press salon, hospital, ice plant, and engine room. Most of exciting of all: those who showed up just after noon would witness the solemn ceremony with which the Gardens’ four new escalators would be inaugurated. They’d gone in over the summer at a cost of $200,000, two on the west side of the main Carlton Street entrance, two on the east, to raise fans up to the second-level seats. Captain Sid Smith was on hand to snip the ribbon, and he was joined by six of his predecessors, Ted Kennedy, Syl Apps, Bob Davidson, Red Horner, Charlie Conacher, and Hap Day, along with other Leaf alumni: Joe Primeau, Ace Bailey, Turk Broda, Andy Blair, and Busher Jackson. “I hope the team goes the same way as the escalators — up,” Conn Smythe said, as you’d guess he might, to some of the estimated 20,000 people came through the doors that day. He couldn’t know, of course, that another seven years would pass before the Leafs won another Cup, and he was bullish about his team’s immediate prospects. The Gardens’ escalators, by the way, are reversible. It is too early to say if Leafs are too. 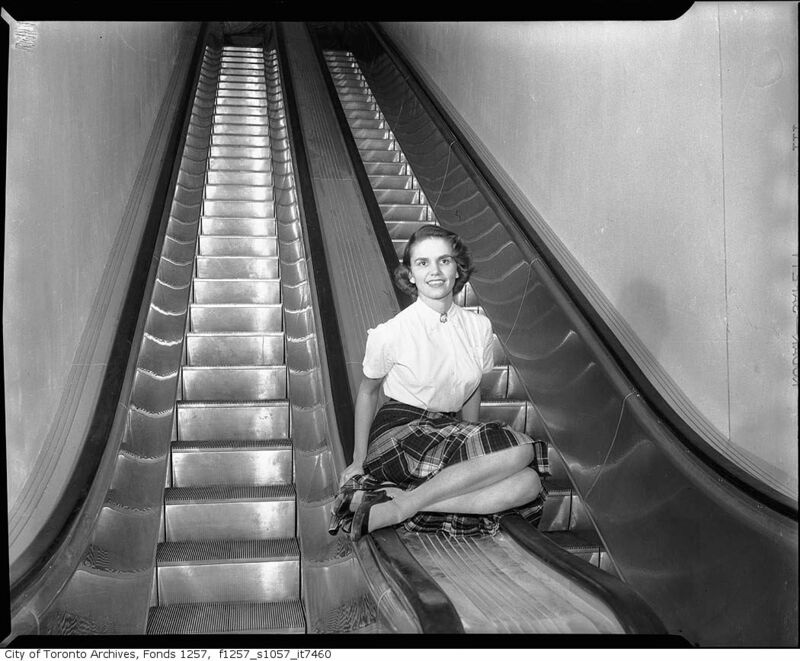 This Way Up: Donna Falconer, secretary to Gardens’ building superintendent Shanty MacKenzie, poses on the new escalators in October of 1955. Falconer would marry a Leaf, two years later: the first of the forwards named Dave Reid to play for the team.